In the world of comic books, death is more of a polite suggestion rather than a permanent state of being. Living things die, dead things come back to life, and many other things get caught somewhere between. This is something Mike Mignola’s Bureau of Paranormal Research and Defense has always known. For the past 15 years, Mignola’s B.P.R.D. series has been chronicling the adventures of its titular agency as it’s taken on all manner of otherworldly demons working to destroy the earth for one reason or another. For the most part, the B.P.R.D. 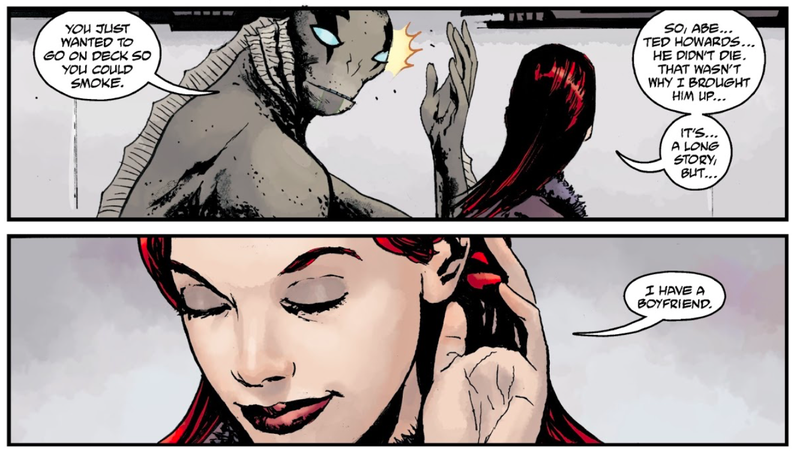 comics have always focused on the organization’s agents other than Hellboy, such as Abe Sapien and Liz Sherman, in order to provide narrative context for the broader Mignolaverse. This became even more relevant when Hellboy himself straight up died during 2011's Hellboy: The Fury and ended up going to hell, which you can read all about in... Hellboy in Hell. Since then, Liz, Abe, and the rest have been getting on just fine without their big, red demonic pal, but in this week’s B.P.R.D. : The Devil You Know #5, the crew makes a discovery suggesting that Hellboy might not be quite as dead-dead as the world once thought. Though Mignola says this big reveal was planned a while ago, it’s not exactly inconvenient for the overall brand. You might have heard about that new Hellboy reboot starring David Harbour (and not directed by Guillermo del Toro) that’s coming out soon. We’ll keep you updated as the story unfolds.